PdG's 2016 Favourite Aunties and Old Comrades Reunion Tour: Hello Kigali! In some ways - I'm thinking environmental policy - it's more advanced than New Zealand. While I was waiting in line for a visa I used the time to repack my bag; an official noticed I'd wrapped some of my stuff in plastic bags and came over to give me a gentle scolding. Yes, the plastic bag is not just banned from supermarkets here, it's a form of illegal contraband. I had to promise to take my evil plastic bags back with me to New Zealand after my visit. 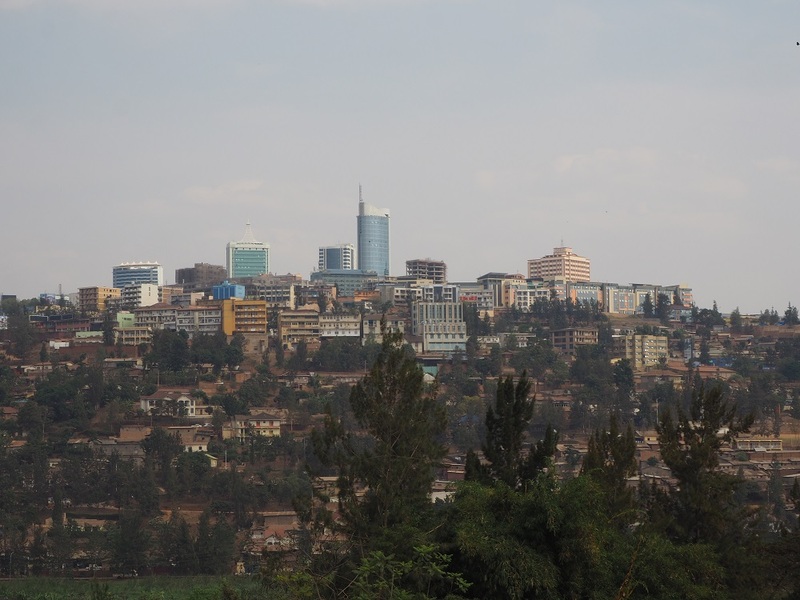 Kigali is also an attractive city, if not terribly exciting. It's mostly low-rise and sprawls over a series of hills sprinkled liberally with trees. Going anywhere involves going up and down a lot of hills so walking loses its appeal pretty quickly. At least the altitude and cloudy skies so far have kept the temperature pleasant, which makes a nice change from the energy-sapping heat of Moldova. As for the people, they are friendly, unhurried, calm and softly spoken. Sometimes you have to lean in to hear what they're saying. It was a real novelty to arrive at Kigali airport and not be immediately surrounded by taxi touts trying to drag me in different directions. Instead, I was left alone for about half an hour; eventually someone politely enquired whether I needed assistance, then came back ten minutes later with a taxi driver. There's no obvious poverty but I'm assured there's still plenty in the countryside and hidden away on the fringes of the city. And, like most capitals, Kigali gets more than its share of government cash and foreign investment so people here are etter off than in the rest of Rwanda. All the same it's remarkable what Rwanda has achieved when you consider that just over 20 years ago the country was in ruins and a million people were dead, murdered by the army and militiamen in just 100 days. The transformation seems almost miraculous.